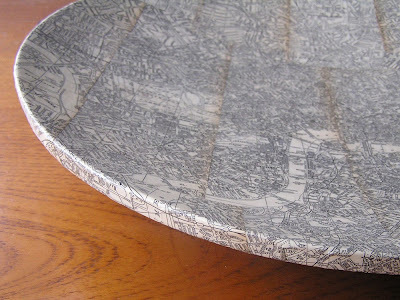 These decorative plates and bowls from London-based decoupage artist Bombus are crafted from bits of vintage maps, atlases, and other paper ephemera. The paper is used to sheathe a bamboo core before the whole thing is sealed with glossy lacquer. 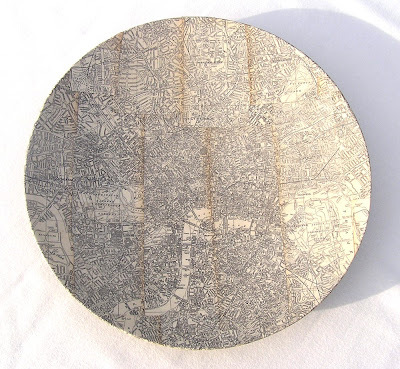 The London Platter, $145, was created with pages from a 1940s street map, and measures about 18 inches in diameter. I love how, from afar, it has such an intriguing visual texture -- and how the streets, avenues, and waterways wending their way across its surface come into focus only as your draw near. 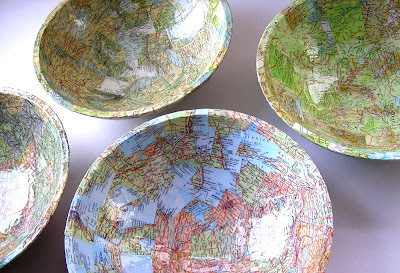 The World Atlas Bowls, $125 each, are made to order using vintage atlas pages depicting the locale of your choosing. You can see Bombus's decoupage creations in her Etsy shop, and more of her work right here. THese are great. I've got a ton of old maps!